The Peninsula Century Fall Challenge takes place Saturday, Sept. 14, 2019 at Sister Bay’s Waterfront Park. Registration opens March 1st. Whether attempting the 100-mile, 62-mile, 50-mile or 25-mile routes, the Peninsula Century ride will be an incredible experience for riders of all abilities. The 100-mile route contains 2,871 feet of elevation with multiple climbs. Participants in the 100-mile route may also participate in the King of the Hill Challenge>>. The 25-mile route takes riders on a flatter, easier route through the center of the peninsula. Planned by avid cyclists who know Door County better than anyone else, the ride is capped at 1,200 riders to ensure the best experience possible. The Peninsula Century begins with a rollout start at Sister Bay Waterfront Park at 7 a.m. and finish with a post-ride party featuring a gourmet taco bar from Thyme Catering, desert of cherry crisp from Seaquist Orchards and ice cream from Door County Ice Cream Factory, and Door County Brewing Co. beer and music beneath a tent at Waterfront Park. With an array of lodging accommodations just a short walk from the festivities, participants can ride to the start line at Waterfront Park, and walk to area shops, restaurants, and taverns after the ride. There will be two roll out times for the rides. Those riding in the century, metric century, and 50-mile ride will start their ride with a rollout at waterfront park at 7 am. They will be followed by the start of the 25 mile ride at 9 am. We have extended the aid station windows and the post-ride meal this year to accommodate all riders, but we strongly advise that all riders start as close to the posted times as possible to ensure access to all aid stations, food, and perks of the event, especially riders who expect to average less than 14 miles per hour for the ride. Be advised, there are several significant hills on the longer routes. No, it’s not like riding in the mountains, but it’s not flat either. Rest stops will be found on all of the routes for riders to stop and fuel up on food and beverages. Each rest stop is staffed by a Door County non-profit who will be receiving a donation from the ride. Please thank them for their help with the ride and their contributions to community organizations! Serving: water,HEED energy Drink, bananas, oranges, cookies, trail mix, peanut butter pretzels, brat bites from Fred and Fuzzy’s Waterfront Grill. Serving: Water,HEED energy Drink, chopped melon, peanut butter pretzels, veggies and dip from Grasse’s Grill. Serving: Water,HEED energy Drink, bananas, oranges, subs (turkey & veggie option with cheese), cookies, peanut butter pretzels. Serving: Water,HEED energy Drink, pineapple chunks, cookies, granola bars, GU, beer cheese soup and soft pretzels from Husby’s Food & Spirits. After your ride, we’ll be serving a post-ride meal from Thyme Catering featuring a gourmet taco bar with pork, chicken, and veggie tacos, rice and beans, and a desert of cherry crisp from Seaquist Orchards and homemade ice cream from the Door County Ice Cream Factory. You’ll also get unlimited Tapuat Kombucha and one free beer from Door County Brewing Co. Experienced mechanics will be stationed at most rest stops along the route. There will not be a mechanic at the Baptist Church stop in Ellison Bay. It is recommended to ride with a cell phone along the route, in case of emergency or the need for mechanical assistance from the Sag Wagon; however, your cell phone may not work at all locations along the route. A mechanic will also be stationed at the starting line until at least 9:30 am. Temperatures in mid-September average in the high 50s; however, it is cooler by the lake. New this year, we’ve added a gear check at Murphy Park, at mile 29 of the century route, so you can stay warm in the morning and shed layers as the day warms up. Riders may pick up packets and maps at Waterfront Park in Sister Bay. Hours are 4 – 7 pm on Friday, September 13 and 6 – 9 am on Ride Day Saturday, Sept. 14. 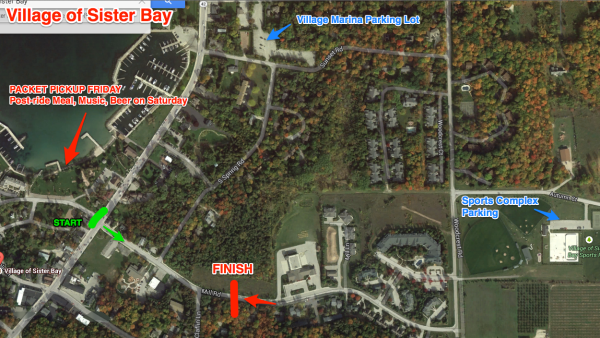 Waterfront Park is located at 648 North Bayshore Drive just west of the corner of Bay Shore Drive (Hwy 42) and Mill Road in the center of Sister Bay. While all four courses have been designed to avoid high traffic areas, the routes will not be closed to traffic. All bikers should follow the rules of the road, including stopping at stop signs and riding single file on the right side of the road. It is recommended to wear a helmet when bicycling. 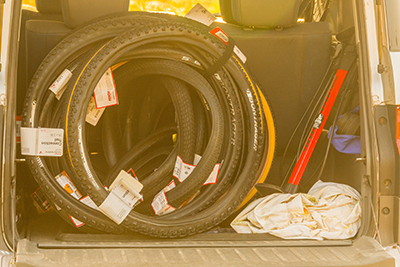 All routes will follow regular state, county and local roadways and are used by automobiles, trucks, buses, bicycles, motorcycles and farm machinery; they have no special provisions for bicyclists. Bicyclists participating in the Peninsula Century, using the map and the marked route, assume the responsibilities and risks for their own safety when cycling. The bicycle is classified as a vehicle under Wisconsin state law (WI Statute 346.02 (4)) and has the same Rights AND RESPONSIBILITIES as motor vehicles, including the right to use public roads unless specifically prohibited. The safety of bicycling depends on the conscientious efforts of bicyclists and motorists to obey traffic laws and act with mutual consideration when sharing the roadway. Participants staying in Sister Bay will have the convenience of riding their bikes to Waterfront Park for packet pickup and the start of the ride at Waterfront Park Saturday morning. 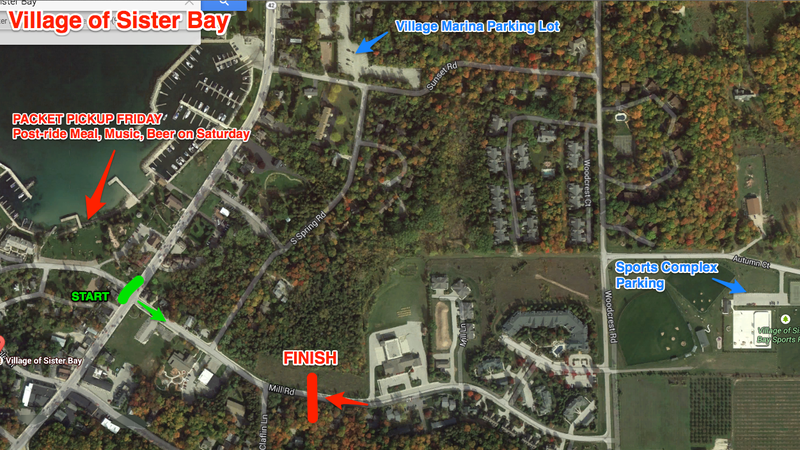 Others are encouraged to park in the Marina overflow parking lot or at the Sister Bay Sports Complex, both of which are just a short ride from the starting line.